The PC Woodchipper is a powerful 3-point hitch-mounted woodchipper for tractors with 80-150 hp. It is powered by the tractor’s PTO through a power-transition axle, while the woodchipping machiery is driven by the tractor’s internal hydraulics. The PC Woodchipper is available in a srandard model with a continuous discharge chute which can be rotated 360 degrees and locked for discharge disrection. When setting the feed plate, the discharge distance can be adjusted. 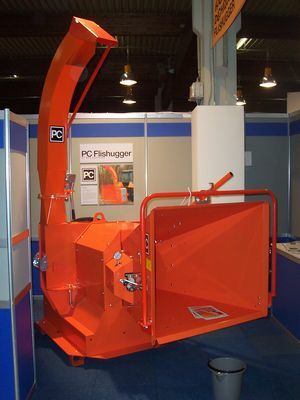 Alternatively the woodchipper is available with a fixed discharge chute that cannot be rotated. The woodchipper can chip branches and wood to a diameter of up to 22 cm, depending on the nature of the wood. The infeed chute’s opening is so big that it is normally unnecessary to trim the wood before treatment. The infeed rollers are horizontal, providing the strongest construction and best secuurement of the wood. 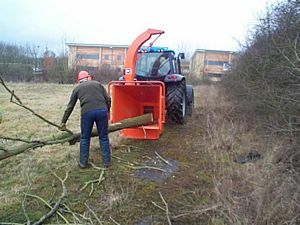 The woodchipper is available in a standard model with 1 overlying infeed roller specially constructed; an extra underlying roller can easily be added for further securement of the wood. The inertia force in the powerful rotor ensures smooth running with least possible shock load. The PC Woodchipper is easy to service and maintain and can be disassembled without using special tools. The use of woodchips can be expected to increase heat output in relation to ordinary firewood by 20%. Similarly, 1,000 litres of fuel oil for heating can be replaced by 14 m3 of woodchips. At current oil prices a change to woodchips may well be advantageous. In addition to heating, woodchips can also be used for soil improvement or composting. The PC Woodchipper is CE-marked and meets the requirements for machine protection of the Environmental Law.